Not only true worshipers of the brand, but direct rivals of the company cannot keep indifference after its last announcements. The company of Nokia has announced principally new phones of the N-line, corporate E-series, glamour L'Amour phones and some sliders for the last couple of months. And if earlier they offered models in other form-factors different from classical candybar very rarely, then now it is rich in clamshells and sliders. A today customer is thoroughly spoilt and aspires to variety. Ignoring these demands means losing to competitors deliberately. And even the world market leader can't afford it. The 6270/6280 are very close to an earlier described Nokia 7370 in construction, software and hardware components. And that is why this review will emphasize on the differences between them. And now some words about the differences between the 6270 and 6280 actually. A pair of loudspeakers integrated into the 6270 are considerable difference. They provide volumetrical sound. They aren't enables at calls, though work when listening to the radio and music. I won't discuss the stereo quality at such a distance between the loudspeakers, and will only note that now integration of stereoloudspeakers providing 3d sound becomes a tradition for top models. The younger model also lacks a camera for videocalls. And the next slight difference is another battery type. You can use interactive manuals to get acquainted with both phones closer. You can clearly see from the manuals the differences are really nominal. And the decrease of the price for the 6270 is quite appropriate considering the absence of the frontal camera. And here I'd like to note that Nokia remains loyal to its "ideal phone" policy. Compare a fashion 7370 and a business 6280, you will surely find it. As the software and hardware platforms are equal the elder model should logically have at least not fewer installed applications. 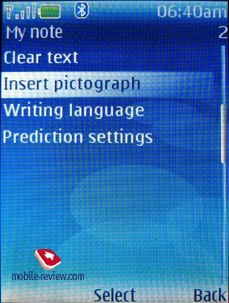 However at the presence of a 2MP camera and a memory card (the 7370 is equipped with a 1.3MP one and has no memory card) the developers "forgot" to install Picsel Browser, which allows viewing office documents, into the 6280. To be fair, I'd say that in the absence of TV-out you will hardly see much on the phone's screen, however plain documents are quite easy to understand. Anyway here we do not consider creation and editing. The phone weighs 115 grams at the size of 99.9x46x21 mm. 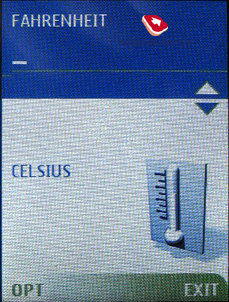 The main part of the front facet is taken by a TFT screen. 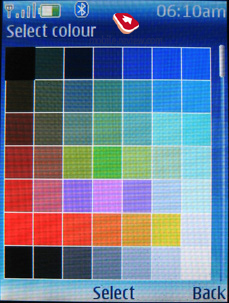 At the physical size of 35x45 mm and 56mm diagonal (2.2"), it can show 262K colours and has the resolution of 320x240 pixels. The dot size resulted in better sharpness and higher contrast and brightness. 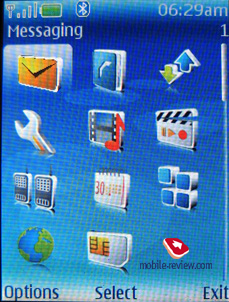 The screen won't fade in direct sun rays and texts will remain readable. In characteristics the display won't lose to Panasonic, Sharp and Samsung products. But to tell the truth, the bit increase when passing to 262K is more a marketing measure and only demonstrates technical capabilities. You will not notice any significant differences from 65K colours. The official description on the site is full of inaccuracy. The loudspeaker's position is defined incorrectly. 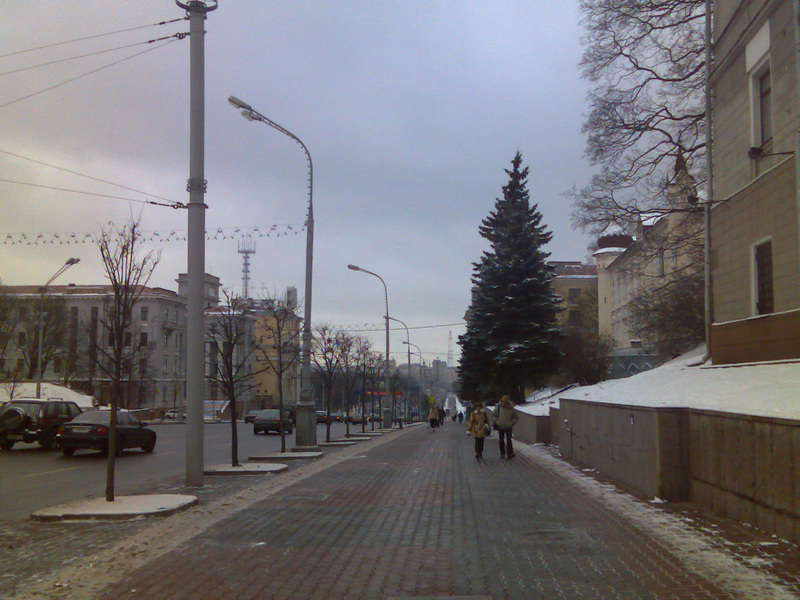 It is placed on the left side surface. However that is not like in the N-Gage, the loudspeaker is very powerful and heard well even without turning the edge. 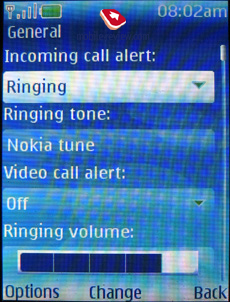 If you set an mp3 as a call signal, you will notice the volume dramatically decreases. Control buttons are large and there is enough space for them. The 5D joystick found room in the center of the block. The button edge raises above all other control keys and a selection button is deepened a little. This helps avoiding accidental pressures. 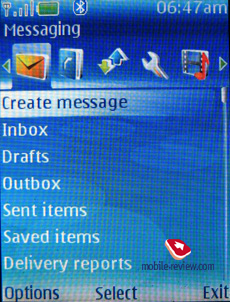 Except for entering texts you can fully use the phone in a closed condition. 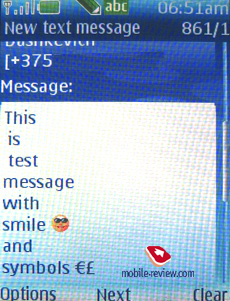 However sending a template SMS is also possible. The handset is produced in two colour versions, which are silvery black (Carbon Black) and the same with a silvery front panel (Graphite Grey). As for me, the first version is more stylish and spectacular. The slider opens easily and smoothly, the auto finishing mechanism works very clear. The left side holds a Push to talk button, a loudspeaker gap and a memory slot. An IrDA gap is also there but closed with a plastic layer and doesn't distinguish from the rest surface. Only experiment revealed this. We placed the phone with another edge to the receiver and got an error report when switched IrDA on. The format of memory card is also changed. Here the company refused RS-MMC Dual Voltage and applied miniSD. However the memory slot construction has become a de facto standard. If you remove the plastic shutter, slightly pressing the card, you can free it of the internal fastening. After you close the shutter, the card will be automatically defined. Hot card change is provided. 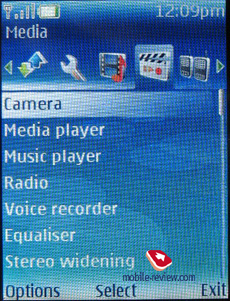 The right side features a volume swing-like button and a camera button. 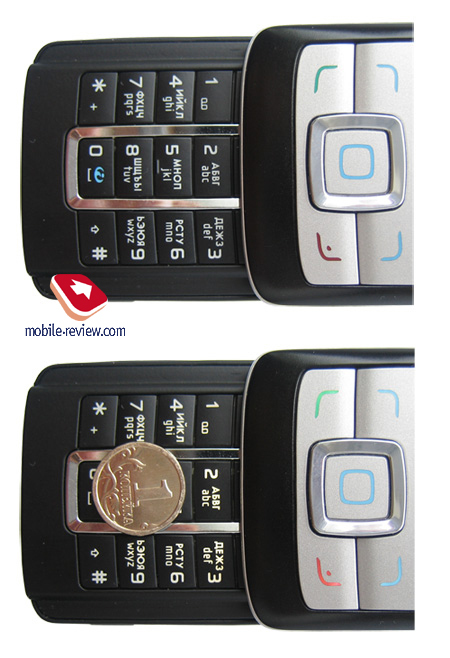 On the top phone end you will find an On button and the bottom holds a Pop-Port and a new style (slim) charging connector. This is the first company phone supporting USB 2.0. A 2MP camera block is on the back panel, it contains an objective, a mirror and a light diode flash. You can use the camera in vertical mode, however that is rather uncomfortable as the forefinger closes the objective. And still the best way to place the camera is in horizontal line. Then you will experience no troubles with shooting, the shutter button is in the right top corner, and a coupled volume button serves for changing zoom. No extra fastening is used to fix the panel to the body and the panel goes up at a slight, however noticeable effort. The battery is Li-Ion 970mAh. 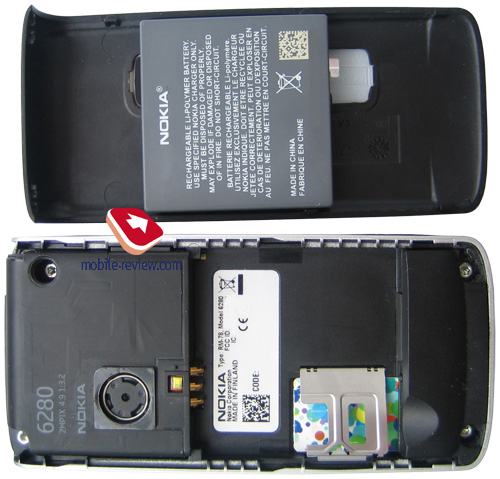 The same battery type is applied in communicator 9300 and Nokia 7710 phone. It is a little smaller than traditional BL-xC batteries, however the capacity is comparable. 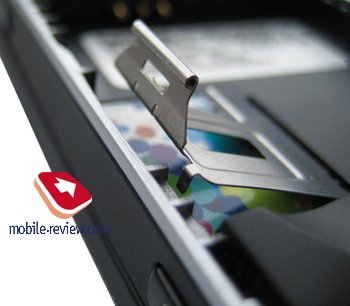 You will need only to hock the battery through the gap in the body to remove it. In a test sample we had the battery joining the grove very closely, and that is why we used a SIM holder several times. In GSM networks the phone will work up to 3 hours and up to 2 hours of work is provided in WCDMA. In standby mode the handset will last for 11 days without recharging. 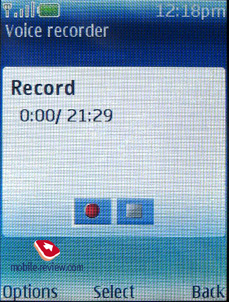 When we tested the phone with Bluetooth and radio on, and about 20 minutes spent on talks, it lasted for approximately 5 hours. The main keypad is of small size and backlit in white. 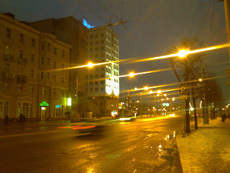 Characters are seen well in the dark and Russian and English inscriptions do not merge. The buttons are placed in even rows. Their surface is projecting and well felt by touch. A silvery metallized line distinguishes the central row. The motion is elastic, smooth and clear. Traditionally good assembly. The back panel joins perfectly, so that creaks at pressure are really absent. 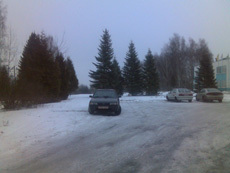 The only thing that causes fears is too thin side plastic; however it is almost impossible to damage them accidentally. 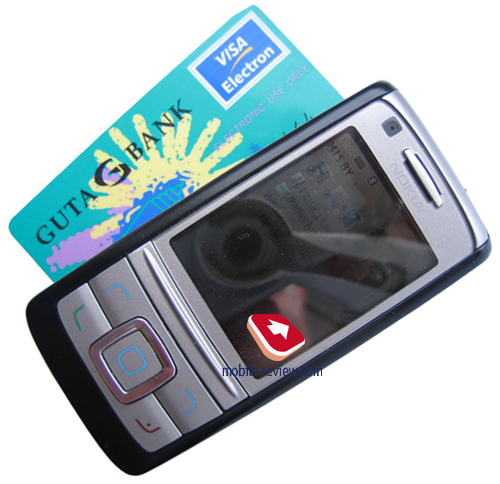 The device can work without a SIM-card, as an organizer (finally the capability is realized). However then options connected with the system function are not available. When you turn the phone on, you are supposed to watch a demo clip about the phone's capabilities. Then you can switch the option off and delete the clip. This will save almost one MB of memory. In WCDMA networks the handset will provide the speed of 384/128 Kb (receive/send), in GSM networks the maximum data transfer speed reaches 236.8 and 118.4 Kb for data receiving and sending correspondingly. Also support for GPRS/EDGE class 10 is provided. A user can access about 7 MB of memory dynamically shared by all applications. Preinstalled applications and Java games take about 2MB, gallery files require about the same size (you can erase them all), and the rest memory (2.9 MB) is shown as free. All resources claim 74 MB of memory, and seem to include 64 MB on the memory card, but anyway the number is not correct. Screen. Data output in standby mode. Data output on the screen is reworked completely. A similar organization of standby mode was applied in 7370 before, and a link on the review is provided above. That is exactly the redesigned standby interface, which is one of the peculiarities of the new Series 40 edition. The new interface holds two major differences from the previous version of data presentation. The first is complete absence of service lines marked with color. 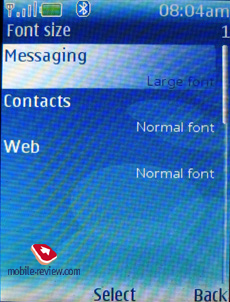 All service signs and icons are shown on the general screen background. 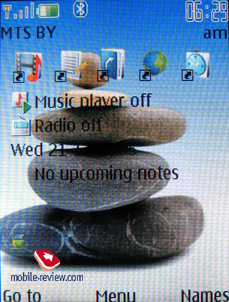 The top of the screen holds icons signifying the network condition, battery charge, connection of wireless services and so on. And the second innovation implies active standby, which prototype is a "Today" PDA screen. You can adjust a line with applications, which appears in this mode, according to your wish. Two lines for fast launch of applications are displayed a little below. You can also adjust them as you like. 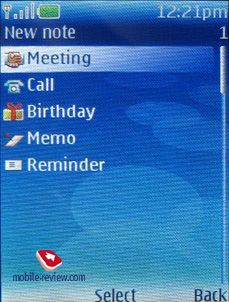 Also it is possible to show a personal note reminder on the screen. Activation is possible by deviation a navi button to some direction (up, or up and down). You can switch the icons using horizontal deviations of the joystick. 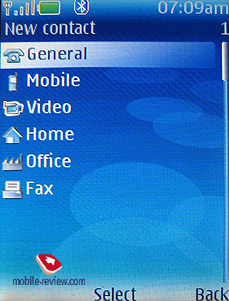 Generally this standby organization allows using almost all possible functions without opening the main menu. 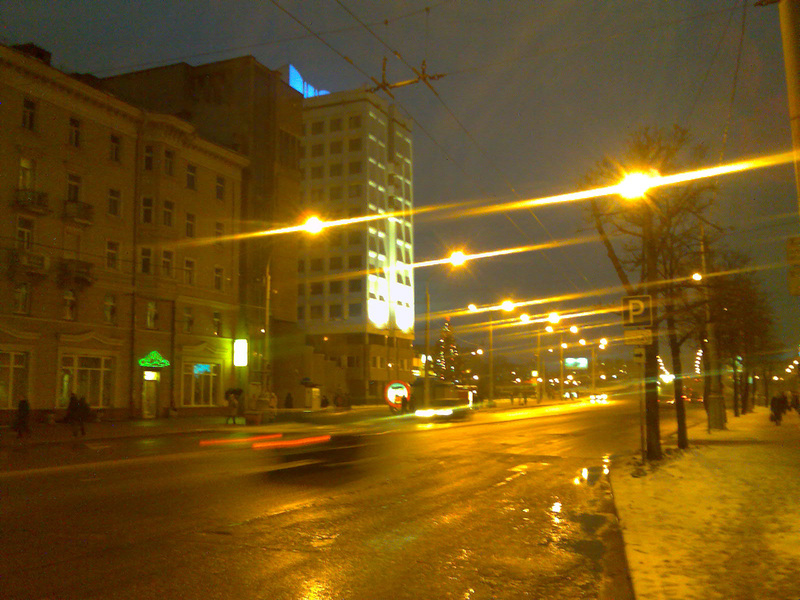 Backlighting period is not adjustable, which is traditional for Nokia's phones. 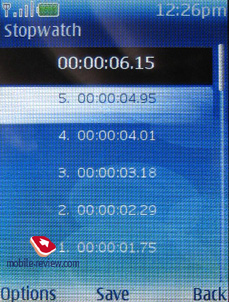 And the screen remains active for averagely 6-7 seconds, and then fades. 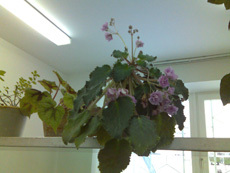 In fact, it is rather too little to read even a short SMS. And unfortunately, the phone is not an exception. You can turn the backlighting permanently on in the battery charging mode. 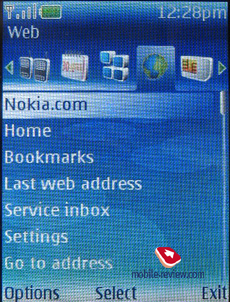 Fast access function can be adjusted for all buttons of the top panel. They are very easy to set, and that is why I won't describe the process. There are four ways the menu is represented. They are a list, icons, icons with tips and bookmarks. 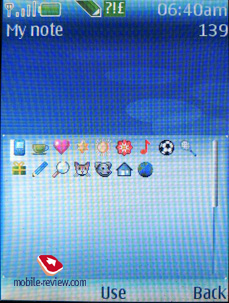 I suppose I won't describe the first three types, and the bookmark mode shows a line with icons of all folders of the main menu. 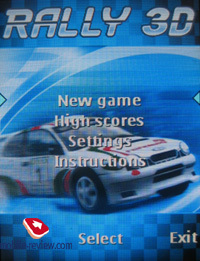 You can move along the main menu with horizontal deviations of the joystick and vertical deviations allow acting in the second level of the menu. Some second layer folders are represented in a special way. 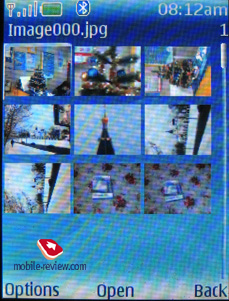 For instance, gallery folders may be shown as a 3x4 matrix. Contacts. 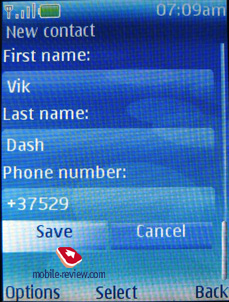 When you enter a new contact, you can fill such fields as name, surname and one phone number. An interesting peculiarity of the name and surname representation is you can add smiles. However they make not much sense, as are displayed as characters at a call. You can increase the number of fields by adding extra data. Extra types of phone numbers are general, mobile, video, home, work and fax. 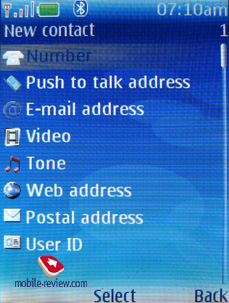 Besides you can add PPT address, e-mail address, a personal melody, site URL, user ID to a contact. You can also provide an entry with a text note. And you are allowed to change the input language in any text line. At four text fields filled for a contact you can enter five phone numbers. If you keep three phone numbers and one text field for a user, the phonebook is capacious of 1000 names. After you enter the fifth number you see the "Add phone number" field gets inactive. 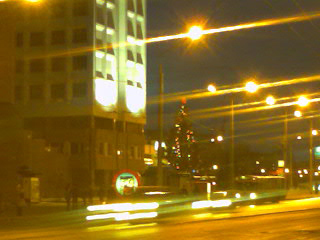 A photo and a sound record may be associated with each user. They are shown on about half the screen. And you will experience no problems with video output at incoming call. Sorting by name and surname is available. And it's up to you whether to show only names from the phone's memory or from your SIM-card also. You will not need to record voice tags specially as they are recognized automatically from the contact. It is possible to listen to the sound tag from the contact functions menu. Voice tag is synthesized independently on the input language and is supported for all local languages. If you enter the contact in Russian, you will certainly notice some accent in pronunciation. First you should listen to the voice tag synthesized by the contact name. It is exactly what you need to reproduce. After that press a "Name" item. And say the contact's name after a sound signal. The device will offer to select a number if you keep more than one for a name. And after your choice the phone starts a call. It will take about half a minute to start dialing after you pronounced the tag. So, this is not the fastest way. Some functions can also be called using voice tags. Number keys from 3 to 9 are available for fast dial. 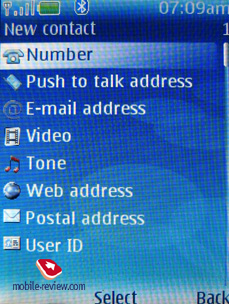 Voice mail is traditionally bound to a 1 key, the 2 key is for videomail. About 25 groups can be created. A melody and a picture can be set for a group. And all groups are shown in a general contact list. Free phonebook memory is shown in percentage terms, which is rather uncomfortable, and a number of free cells would be much more informative. Messages. Chat messages, voice, video, informational messages and service commands are added besides traditional items. 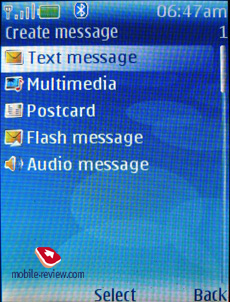 Entering the New message item, you have a capability to add a new SMS, MMS, post card, a Flash message (SMS class 0) and a sound message. 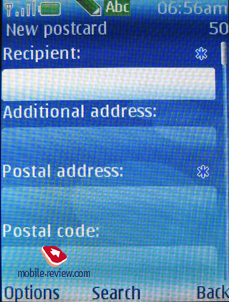 When you create a message, a field where addressee's number should be typed into appears. There you can add a recipient from the phonebook, take the last user you wrote to or select all users of a group. 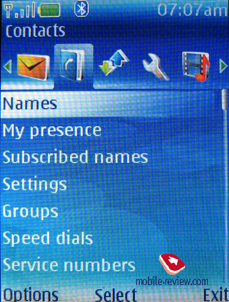 It a user from the phonebook is selected, all available for him/her numbers appear. You can send a message to any of them or to all these numbers. Text input also implies its peculiarities. First the input line takes little place on the display, however the more text lines you add the more this window grows due to vertical scroll. The maximum number of lines reaches 9, with the maximum number of characters equal to 913. 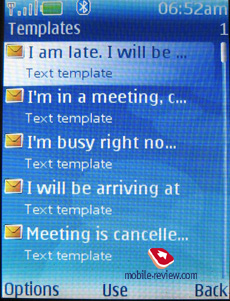 Concatenated messages are also provided. 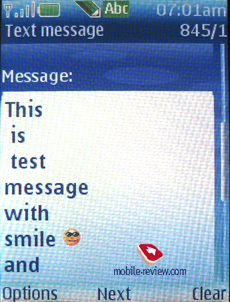 And finally you can add a smile, a text template, a phone number or a contact to an SMS. 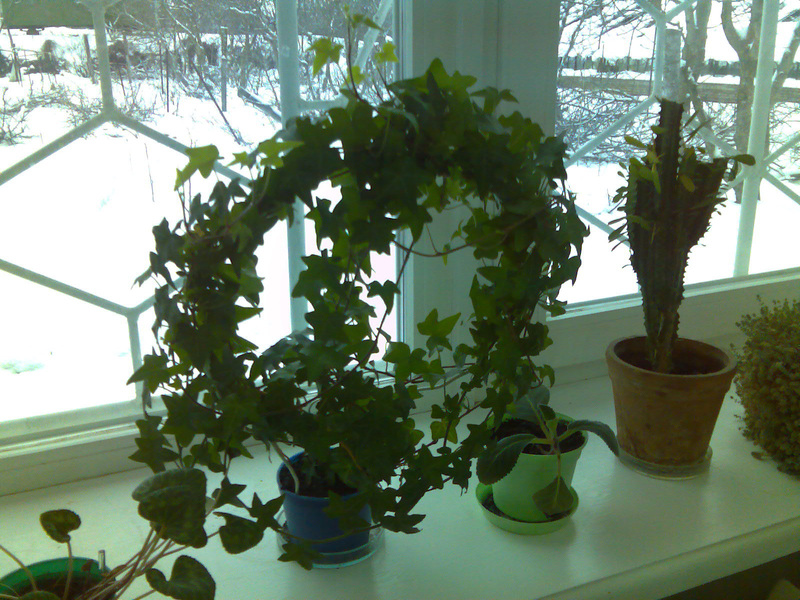 By the way, creating MMS also brings its peculiarities. 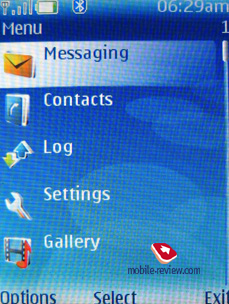 There are several information fields in the main menu where you create an MMS. You can insert text, an image, an audio clip, a video clip, a VCard, a note and a slide into each field. 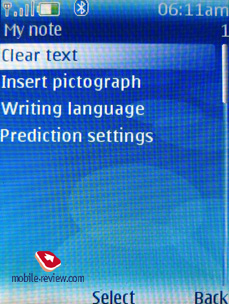 The maximum length of such MMS equals to 300 KB. E-mail is a separate menu item. An integrated mail client works with POP3/IMAP4/SMTP protocols. Files of such formats as doc, pdf, ppt, xls, jpeg, mp3, 3gpp and others can be used as attachments. The handset keeps about 150 SMS and 50 graphical messages. 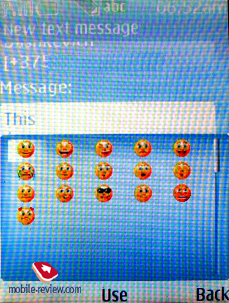 And decreasing the number of graphical ones you increase the number of SMS proportionally. Call log allows saving up to 20 calls of each type. And the same names are saved as one item. You can get information on messages, batch communication and other similar data including costs and details. You should apply you PIN code to adjust these parameters. Settings. 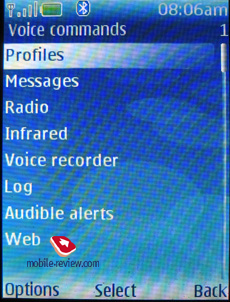 This holds the main phone settings and consists of "Profiles", "Themes" (sets graphical appearance of the phone), "Signals" (with a capability to turn on vibro when any file of supported format is played back including aac and mp3), "Display" and other network, wirelesses service and data settings. Generally the list doesn't differ from a customary one for the 7370. Connection holds settings for wireless profiles. 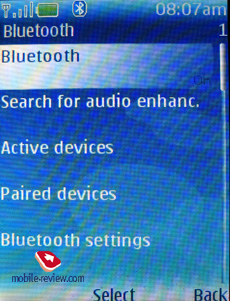 Bluetooth settings provide search for audioaccessories and devices. Active and coupled devices are displayed in separate items. The settings allow adjusting phone's visibility and entering the phone's name. In fact, I found an option for searching for other devices quite inconvenient, as it should be activated at each transfer. Still a function, which would help selecting a device from the active list fast, remains unrealized. A considerable advantage of the protocol realization is a capability to send any file even if the format is not supported. Actually the phone could be used as Mass Storage Device if not the internal memory size. Card-reader is the most comfortable way to write to the memory card. However you can also use the phone for carrying files received via Bluetooth. The following profiles are available - Hands-free, Headset, Object push, File transfer, SIM access and Serial port profile. And support for Bluetooth 2.0 allows transferring stereo sound to a wireless headset. Information about compatible devices can be found on the manufacturer's site. You can only turn IrDA on and off. And the port is fully-functional. In a data transfer item you can adjust synchronization with PC. Also the handset can act as a modem. The software included into the kit allows connection to a PC using IrDA, Bluetooth and a data-cable. 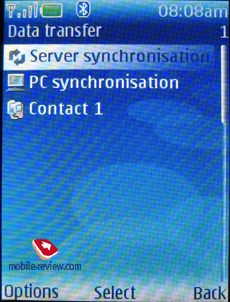 The synchronization program works correctly and Russian is displayed correctly both on a PC and the phone. A USB option gets active when you connect the cable. 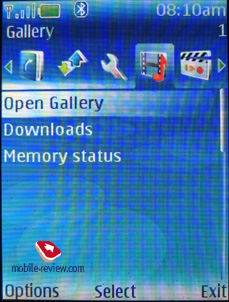 The gallery is a company's file manager. 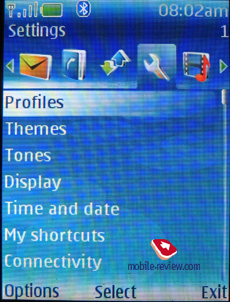 It consists of such folders as Clips, Music, Themes, Graphics, Signals, Audio, Received files and a Root folder. By the way, you can create own folders. I noticed one curious peculiarity when transferred Java-applets via Bluetooth. The previous phones sometimes failed sending data this way. And anyway, first you heard an alert of incoming message and then you were offered to install it. Here they appear in the Root gallery folder and are available for installation immediately. No extra installation is required. This is the way I sent benchmarks, and their results are below. 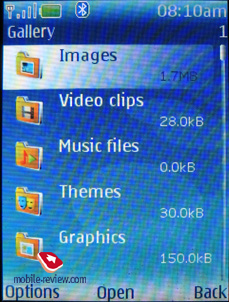 You can always transfer files to any other folder within one item (here that is Gallery folders). However you can't transfer files to the second level folders, which means you can create a folder "Applications" in the Gallery and put the file there, but can't send to a "Temp" folder created inside "Applications". Camera. You can see there are two cameras in this handset. The first one with a VGA resolution serves for videocalls, and the second one is 2MP. As for me, the camera is not an advantage of this phone, as the number of settings is shortened to the minimal. So I will easily enumerate them. You are free to select the compression quality from high, usual and basic. A photo can be of any of five resolutions - the maximum one is 1600x1200, then 1280x960, 640x480, 320x240 and 160x120. From the white balance settings you can select only night mode. The flash can be only on or off, but not used as a lamp. At the same time it can't work in preview and focus modes. That means you will have to shoot in the dark by guess-work. Autotimer can't be adjusted, and by default the shutter acts in 10 seconds. Multishooting settings are also absent. Effects include grey tints, sepia and negative. 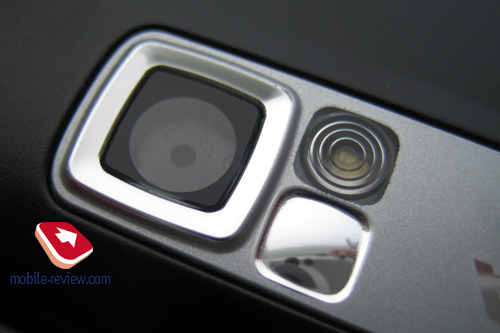 The camera uses 8x zoom, however the photos taken with the maximum zoom value do not stand out for high quality and clearness. The absence of autofocus is also a camera's disadvantage. 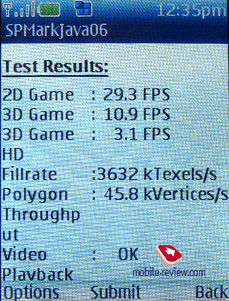 Video resolution varies from 640x480 to 128x96 (352x258, 176x144). A well-known data format is used 3GPP. A 640x480 clip is recorded with a 13.78 fps speed, other available solutions provide with 15 fps. Video can be played full-screen. When I saved a frame with increased size, I was quite surprised. Standard players refused playing recorded video (Quick Time among them). That is true for 640x480 and 352x258 resolutions. And only a Xilisoft converter helped in viewing the clips. And by the way video recorded in the maximum resolution (and especially with the maximum approximation) revealed all disadvantages of 3GPP/MP4 formats. An image separates into squares. And the power of the integrated CPU is obviously not enough for a full processing of the video stream. Player. 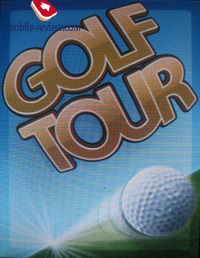 Two players are preinstalled in the phone - Media Player and Music Player. One of them can play music and video files, stream video, shows graphics and represent other multimedia applications on the screen. Also it helps downloading files from the network. 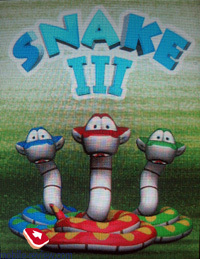 The second player works with only aac and mp3. It also allows adjusting play lists, which are generating automatically, when you select a folder with music. Also then you are notified about the presence and number of files for play back in this folder. An equalizer allows selecting the way they sound; available modes are Norma, Pop, Rock, Jazz, Classic, Register 1, and Register 2. 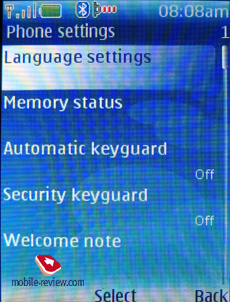 Te player can work in background and continue play back atomically (it stops during a call). If you set an mp3 melody as a signal, you will notice the volume decreases significantly. The phone uses DRM (digital rights management) security protocol, which forbids transferring files protected with digital signature to other devices. Radio. An integrated FM-receiver works only when the headset is connected, it acts as an antenna then. Visual Radio option is supported, it helps showing text and graphical information during the broadcast. The service is not wide spread now, however the phone actually manages it. The radio functions are quite plain. 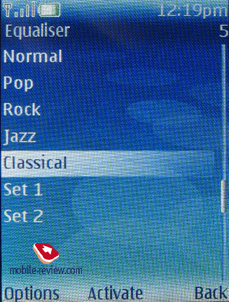 You can't scan the whole diapason; however that is possible in step by step implementation by holding the right virtual button on the radio screen. 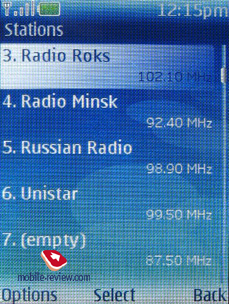 You can enter the frequency and the name of the station manually, save about 20 channels. Stereo sound is possible when connecting a headset or external loudspeakers. Radio can be retransmitted to the phone loudspeaker. Dictaphone uses the whole free memory. 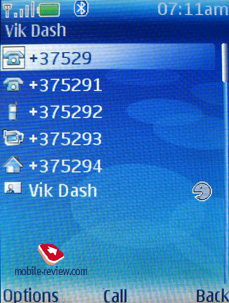 You can select a folder (on the phone or memory card). It allows recording a conversation, however that is not easy. 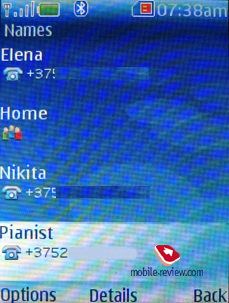 A corresponding icon was added to the activity menu to raise the effectiveness of the conversation, and then you will only have to activate an icon and turn recording on at incoming call. Both conversationalists hear a special tone signal every 10 seconds. 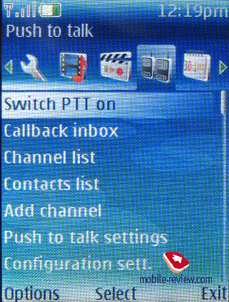 Push to talk - standard settings for the operator supported service. Organizer. 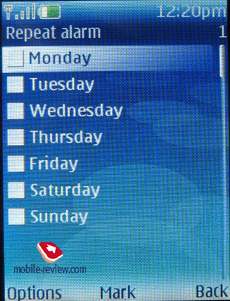 Alarm clock supports week-day signal, selecting a sound signal (even mp3 and radio on time), recurrence is adjustable. However a disadvantage is still present. 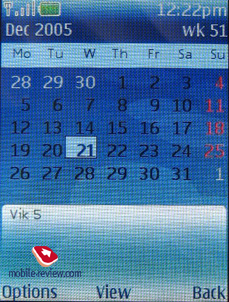 You can't set different time for various week-days. Calendar. Possible events include meeting, call, birthday, note, and memo. A "pass to duties" option allows setting a theme, priority, and period (date and time separately). 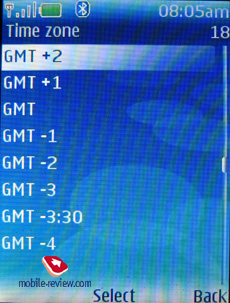 The way events are shown can be selected - weekly or monthly, by the way you can set the first week-day. 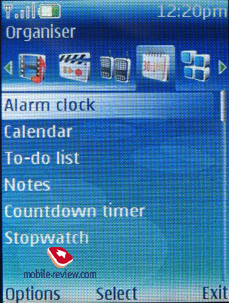 Calendar memory depends on the entry length and can contain from 100 to 250 events, besides, a standard stopwatch with intermediate and cyclic counting out and a timer are at your disposal. Applications. Contains folders Games and Collection. Games. 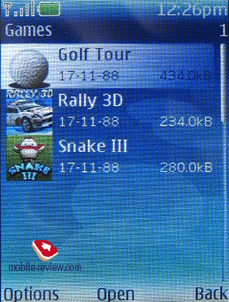 Three games are preinstalled - Golf Tour, Rally 3D, Snake III. They are redesigned for higher screen resolution and start with no delay. Graphics is realized very well. At incoming calls Java-applications can't be minimized, but are interrupted, and you will need to restart them. The current Java (MIDP 2.0) allows download of application from the network and supports 3D. Collection. 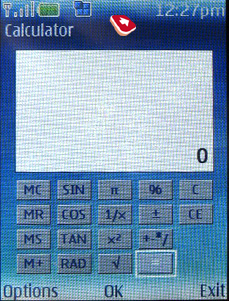 Calculator is functional enough and includes a unit and currency converter. However the converter can be run separately. Temperature, currency, weight, length, area and volume are convertible. Conversion direction can be changed. Any new type of transformation can be added in settings by specifying the start and end values and the conversion coefficient. World time. 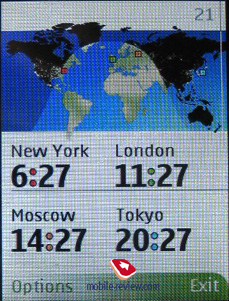 Time settings for four cities. Everything is usual. WEB. Standard settings and network connection options. An integrated WAP browser version 2.0 supports xHTML pages. Operator data. 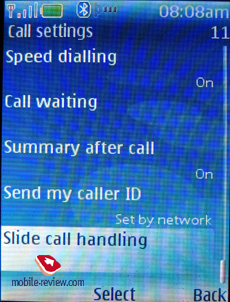 Operator's SIM menu. Productivity. We traditionally used all three versions of JBenchmark. 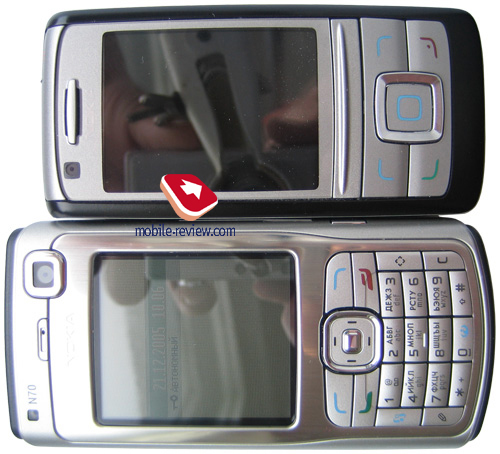 For you to compare we provide results of Nokia 6630 (smartphone), Sony Ericsson K750i and Samsung D600. It is no wonder that the smartphone is an incontestable leader of the tests. And it rather sets the top level. Nokia 6280 won over the Sony Ericsson's product in 3D tests, and Samsung D600 did not pass the test at all due to the absence of 3D support. The 2.0 version of benchmark shows comparable results for the 6280 and D600, and the SE's model is a winner. 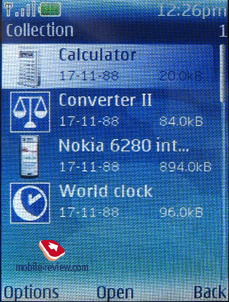 In the 1.1 version the SE's device appears a leader again and the Nokia and Samsung show close results. 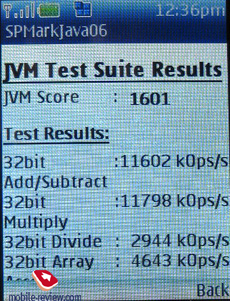 All these results prove that the realization of the new Java machine in Nokia's phone is much more successful, and all applications using this platform on Nokia 6280 will run much faster as this platform is now the basic for developers. Equal results for the 6280 and 7370 reveal the same platform in both phones. 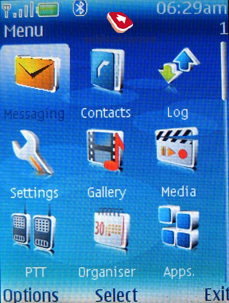 And the absence of Java 3D in Samsung D600 is a real inadvertence of developers. Visually all applications run beyond praise on the discussed phone, games show no slow down. 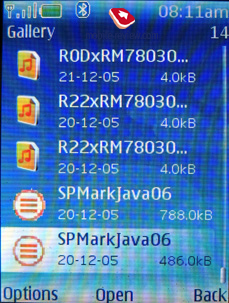 It happened that almost the last day I finally could test the phone with a new SPMarkJava by Futuremark known for its synthetic tests for videoprocessors. 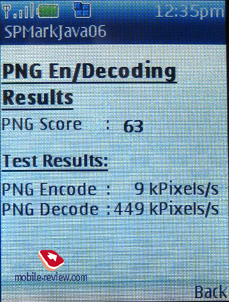 In fact, there are few results of phone test with this package; however I can surely claim that Nokia 6280 outstripped Siemens SXG75 with a considerable gap. You will experience no problems with connection using the phone. The presence of speech improvement and sound equalizer provides clear sound in the loudspeaker even in very noisy places. Vibracall works perfectly. First, it is powerful enough; second, you can switch it on with a musical signal of any supported format. You will perfectly feel the vibracall both in a shirt pocket and in a waist case. 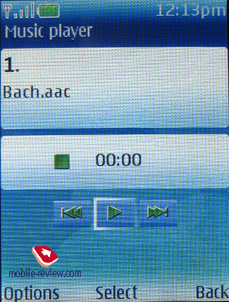 Polyphony happened to lose sense in the phone, now you can set not only an mp3 file but an aac one as a call signal. Despite EMS function is realized partly, it is an obvious advantage. A mistake with a group melody is improved, now it is played back correctly, and is not replaced with a standard melody. A great plus of the model is a simultaneous support for EDGE and WCDMA 2100 (UMTS). By the way, a GSM copy of the phone is called the 6270. And the differences between the models were described above. A couple of 6680/6681 comes to mind. Phone's disadvantages cover low call signal when it is mp3, old version of T9 (it can't guess and autosubstitution), no autofocus in the camera and quite middling themes. And still you can't transfer files and folders to the second level folders. The very fact that Series 40 third edition is used allows supposing the global transfer to the Series 60 in the company. Soon the fortieth platform will be exclusively used in low-end and middle class models. And a feature of new phones is Series 60 with a more flexible operating system. By the way complete transfer to it requires now only a volitional impulse, as technologies and a customer are ready.